Tickets are available on the gate but be speedier by buying online using Skiddle or at our ticket outlets shown on this website !! Tickets for this year's event are available to buy online and from a range of local outlets. We do take everyone’s safety seriously with a perimeter fence around the bonfire and fireworks. Please note that you may NOT bring sparklers, fireworks or alcohol to the event. Tyler Hill Fireworks is a well established event which has been taking place in the village of Tyler Hill, Canterbury for well over 30 years. We are truly a village event, with the majority of volunteers living in the village. We pride ourselves that our event is a truly family one, appealing to all members of the family. There are fairground rides, a coconut shy (for the competitive among you), a tombola and hoopla stalls. We also sell a variety of glow in the dark products, which will certainly make you stand out from the crowd! We have music to entertain young and old at the far end of the field, which adds to the lively atmosphere. There is a variety of food available, including hamburgers, hot dogs and the traditional soup. Refreshments are also available either hot or cold. For the brave among you, we also have an ice cream van – who doesn’t like an ice cream, even in Autumn! 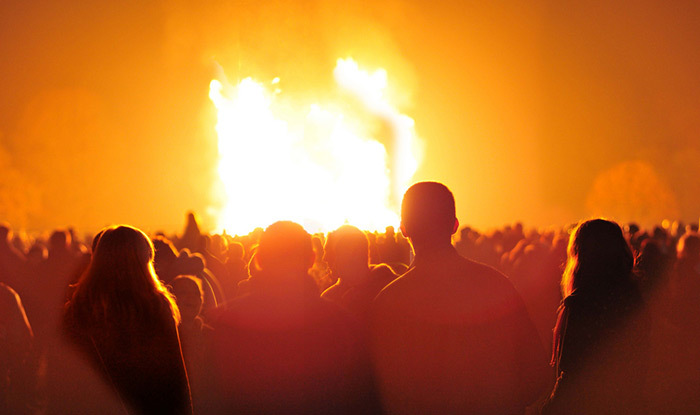 Our bonfire is truly a site to behold, standing as high as a house! This is built by locals and villagers over a period of 6 weeks and takes a lot of expertise to ensure we have a good blaze on the night. We pride ourselves that our firework display is one of the best around, making everyone “oooh” and “aahh” in all the right places. We look forward to welcoming you and your family to Tyler Hill! To avoid delay please refer to website information and our Facebook before contacting us.